Are you noticing a wall leak around your Orlando home? If you have a behind the wall leak, you may experience puddles throughout your home or notice moisture on the walls. You may also see water spots that indicate a problem with your pipes. The origination of leaks can be difficult to determine without a plumbing professional. Noticing any wall moisture or shaking fixtures (i.e. faucet, shower head) in a bathroom or kitchen can be the first step to finding a wall leak. You can also check your water meter to find out if a leak may be occurring. If you find the water meter moving without using water for a period of time, its time to call Sam T’s Plumbing! Waiting too long to have a wall leak inspected can lead to more damage to the affected areas. Not only could the water damage leave a stain but it can bring an unpleasant smell and even the application of mold, which can be dangerous. Our plumbing technicians here at Sam T’s Plumbing are versed in finding wall leaks and have years of experience in the task. Water leaking from a pipe in one room can travel to another. If you have a wall leak in Orlando or the surrounding areas, call Sam T’s Plumbing. If you want quality without compromise, look no further. Call us today for a free water leak inspection. *Inspection is free with repair only. 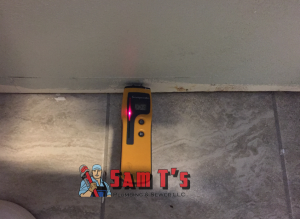 This entry was posted in Leak Detection and tagged orlando plumber, Sam T's Plumbing, wall leak. Bookmark the permalink.